Romney hut at the former RAF Tholthorpe (2012). The Romney hut is a prefabricated steel structure used by the British military, developed during World War II to supersede the Iris hut. At the outbreak of World War II, the British military developed a series of prefabricated huts to supplement the World-War-I-era Nissen hut. The Iris hut was one of these, a medium-scale hut of 35 feet (11 m) span and from 60 feet (18 m) to 96 feet (29 m) in length, with bays of 4 feet (1.2 m) sectional length able to be added as required. However, the Iris hut had a major design flaw; it was unable to resist the weight of snow lying on the roof and had a tendency to collapse after snowfalls. For this reason, it was superseded by the Romney hut by 1941. Both the Iris hut and the Romney hut were constructed of a clamped tubular steel frame with a central entrance. The hut was used to accommodate facilities for which abnormal roof spans were required. 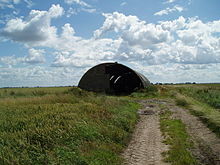 On some airfields, two or more Romney or Iris huts would be erected to accommodate large stores and workshops; or occasionally used as aircraft hangars. ^ Dobinson, Colin (2001). AA Command: Britain's anti-aircraft defences of World War II. Methuen. p. 325. ISBN 9780413765406. ^ Historic England. "Details from listed building database (1412391)". National Heritage List for England. Retrieved 13 June 2013. ^ The Civil Engineer in War: Airfields, Roads, Railways, and Bridges. Institution of Civil Engineers. 1948. p. 90. ^ Smith, David J. (1981). Action Stations: Military airfields of Wales and the North-West. Stephens. ISBN 0850594855. Wikimedia Commons has media related to Romney huts.